Thanks! This is a list of all the countries from which people have visited my website in the past year. It is so exciting to me that most of the world can easily pull up an image of my work via the internet, which I miss referring to as the World Wide Web. It is indeed a web that in most cases, crosses borders effortlessly. I am very active on Instagram @ellenstarrlyon for this reason. Not only do I turn to social media to cultivate a larger audience for my work but also to find inspiration from artists across the globe. Living in a small, liberal, college town sequestered in a conservative state, bingeing on art from so many areas and cultures saves me. I can easily feel isolated in my efforts and this brings a feeling of swimming upstream. I am a mother and a wife. I work full-time to support our family while working nights and weekends to create momentum in my painting career. It is daunting. I can't not do it- my soul depends upon art making. In the last couple of years I began to seek out others, first in my small community and then online. My load is not only lightened by seeing others do what I'm doing but by seeing them succeed. The work they create is beautiful, skillful, inspiring and intimidating (if I allow it to be). In general it feels like a call to action "Let's Do This!" instead of competition; I need that. We all need some level of understanding. Other artists intrinsically understand the struggle, the living in constant vulnerability of digging deep to make art. Of course, most people have issues they struggle with or work that takes an emotional toll but I need my tribe who gets me with specificity. That rhymes a bit, no? If you are reading this and get what I’m saying- reach out, we can do this. Warmer days are here and new work with it! BOST has been such a great way to connect with other local artists and to show our community what we do. Artists can be tucked away working in all sorts of different places. In my case- the dining room has been converted to a much higher purpose, art making! 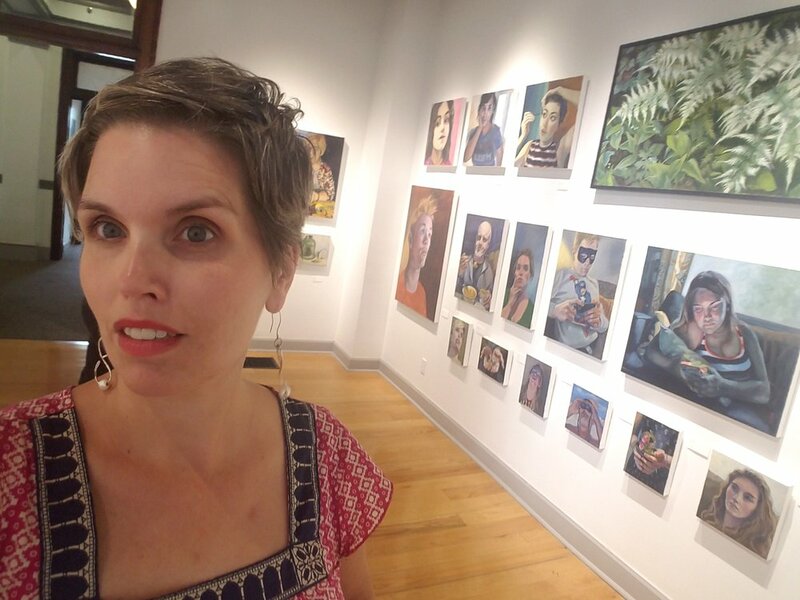 This was my third year opening my studio to the public and each year I meet new people and have neighbors wander in who were shocked at what they find. I am happy to interact, answer questions and demo my craft. I have offered small tokens for purchase as well as original paintings. In the past, it was small quick sketch paintings, this year, for the first time ever, I offered cards and magnets sporting images of my work. If you were unable to come by during Open Studios please contact me about scheduling a visit! Then, take a few minutes to read the excellent article (link above) by Yael Ksander. It gives some insight into the complexity of being a working artist, specifically the complex demands of being an artist and mother. Thank you Yael for coming by to speak with us and telling a bit of our stories. My story is so incomplete without mentioning the support of those close to me that make these events possible; notably, my husband and kids, my parents, and friends. A special shout out to my patrons, I could not continue to produce without you. Follow me on Instagram @ellenstarrlyon and www.facebook.com/ellenstarrlyonfromthestudio for process shots, events and behind the scenes of studio life. Look closely, can you spot the studio cat? Here I am painting from life during the tour- Asian pears and Mahjong tiles! The newest member of the family, Frida! you can revisit my portrait work and see what's new by scheduling a studio visit or stopping by during the Bloomington Open Studios Tour, October 21st and 22nd. With this body of work, my aim was to capture the beautiful fleeting moments of my family that exemplify the look and emotion of that time. I can't get enough of my children's faces at each stage. If you are intrigued by this, consider commissioning a painted portrait. Together we will choose a size and talk about your ideas. I will then make home visits and take my own photography for reference. I would like to send a huge thank you to all who modeled for me. I did use mainly photo reference but those who agreed to pose had to endure me taking photo after photo, with directions to move this or tilt that or take one step back and now move right. Art, Finn, Odessa, Mom, Ami, Dad, Ceci, Val, Bella, Cara, Emma and our kittens: Betsy and Frida. A special thanks to my children, Finn and Odessa, for putting up with this many many times. There are so many more of you that I would love to paint! Thank you to my crit group and fellow artists in BOST for all the support and creative interaction. Especially Meg Lagodzki who answers all my anxious texts and Christy Wiesenhahn- our third on the ever memorable Minnow's Fart artist retreat. Warm hugs to all those that follow my work online and cheer me on. Deep appreciation for those who collect my work. You see the value in original art and make it possible for me to keep working. It takes a (art) village! I had so much support from friends and family: Mom and Dad, Ami, Ceci and Stefanie. But the herculean task of keeping family life going fell to my amazing husband, Art. He made it possible for me to create a new body of work in 9 months while both of us working full-time jobs and operating on a tight budget. One last shot of the space before taking the work home. There's still time! My solo show SELF . CENTERED runs through Sept. 23rd. I would love for you to see my newest body of work. the exhibition is up through the 23rd of September. Listed below are the address, gallery hours and an excerpt from my artist statement. "With this body of work I have moved from creating portraits through plants and objects to traditional portraiture. I have painted the figure in the past and have been called back. The call came with a vengeance and would not be denied. At the urging of a friend, I returned to figure drawing sessions on campus. This was the spark that got me to paint the first portrait of my son, Finnian. That was last fall and I never looked back. In the last nine months or so, I have been at the easel every day. The creation of this body of work has felt like the labor of my children; hard, fast, often painful but also full of joy. This group of portraits focuses on the people closest to me, emotionally and physically. Our lives are all so busy with what feels like constant motion. With these images, I am collecting moments that to me describe the person or show a beautiful, ordinary scene. Within that context, there are other themes. The main vehicle I use to show life is hands. They convey so much: action, thought, age, and emotion just to name a few. A lesser theme I wanted to paint about without being heavy-handed was technology. It is the cause of much heated discussion in my house and in those of other parents. Technology is such a double-edged sword and I believe my ambivalence shows; the devices create a splendid light but the faces of my children are withdrawn and there is no engagement with the viewer." Dorian Gray in his ballroom in Penny Dreadful. One of the sources of inspiration for my upcoming show was the depiction of Dorian Gray's ballroom in the television show, Penny Dreadful. The terrible power imbued in Mr. Gray's portrait has always fascinated me. Seeing it brought to life in gory detail recently got me thinking of the true power behind an image of the human face, an image with clues about the sitter. But what really blew me away visually is the ballroom of portraits. The way it is shown in Penny Dreadful, is a seemingly large, opulent, usually empty room. But the room is far from empty; the walls are covered with portraits of all shapes and sizes. They are hung salon style (to the extreme). The portraits are of different people, different styles and different frames. It is wondrous and beautiful. Each episode I found myself begging the camera to slowly pan those walls as the the star of the show rather than the actors. This is the effect I hope to give at my exhibition, though with a modern twist. I'd love to hear our opinion about portraiture in general and the effect created by a large group of portraits hung together. To me, the power of the relationships just doesn't come through as well in a gallery setting. They belong in the intimate setting and lighting of the home- no matter how cramped or grand, just like the people themselves. Specifically my portraits. I miss their chatter in my studio. It was a loving, comfy crowd, stacked and jumbled with affection. We are stronger together after all. Next time, I would love to have them all elaborately framed and hung in a chummy fashion to off set the cold walls of exhibition. And yet, take a close look at my tribe and how they gaze around the room. They reach out to one another, or look inward and yes, some are looking at you. Enjoy! My Feature in Bloom Magazine!! When you reach for the latest glossy, gorgeous copy of Bloom Magazine, flip to page 24 for my feature! It was such a great surprise in April to be contacted by freelance writer Tracy Zollinger Turner about scheduling time to chat about my artwork for the August/September issue. We had a great conversation and the results are now in print. James Kellar, free lance photographer, came to get some shots of my studio, providing a sneak peek of the work in my upcoming show at The Ivy Tech John Waldron Art Center which opens August 26th with an opening reception on Friday, September 1st. If you are interested in my work or process, don't hesitate to contact me at ellenstarrlyon@gmail.com . Beginning of "Raw-boned, Raw Emotions"
I am preparing for a solo show that is scheduled for September. It may seem too early for fretting but I assure you its not. Especially this time. Worry about having enough time to finish a new body of work is normal. Worry about the expense of materials is normal. This show feels very different to me because not only am I creating a new body of work, the work is a new challenge for me. I am painting portraits. This in of itself is not a departure because I have always seen the work I do as portraiture. Now instead of plants taking center stage or painting staged still lifes, I am painting people, people I love. What is old is always new again and so it is with me. In college, my focus was on figurative work. After graduation, marriage, moving and children, I had moved to describing a person's likeness or story through objects. A few years ago, I turned to the figure once again to paint about my feeling of reclaiming my bodily autonomy with a self-portrait entered into an annual human sexuality themed show. Old was new again and it felt good. Still, I did not commit to this yet because I was caught up in the cycle of painting portraits of my favorite plants that I grew myself. The holistic process of it fascinated me. Then a year or so ago a painter friend encouraged me to come along to a figure drawing session. It was difficult but it was lovely. To spend 2-3 hours drawing was wonderful. The human body -any human body- is amazing and enthralling. So a decision was made, no matter how rusty I felt, I am determined to make paintings centered on people again. Something clicked into place when I began to paint my family. It was an extra layer that pushes me to show more, add more onto the canvas than a physical likeness. True emotion is there as well as a snapshot into my little family at this time. So please continue to check back and see how this plays out. Ultimately it may only please me but it is a path I feel I need to travel. New Website- take it for a spin! My work is evolving and so are my professional needs. I have created a more professional site to put the images front and center. However, I've kept a blog element so that I can on occasion let you know about an event or story. Please check back. I welcome comments. 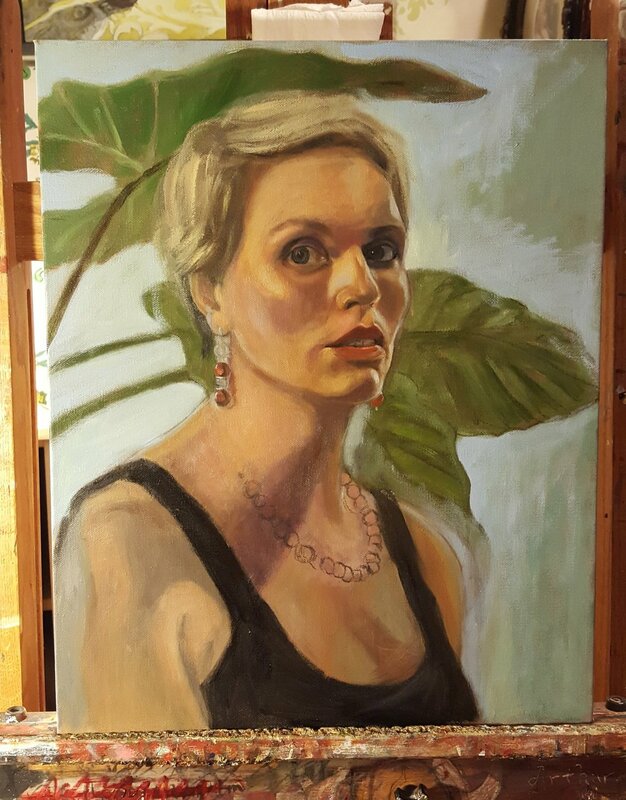 I may post images here of works in progress, like the self portrait below. Also, follow me on Instagram @ellenstarrlyon and Facebook Ellen Starr Lyon-From the Studio.